Giving gifts is a long-standing tradition that most people are accustomed to. Whatever the celebration or milestone is, whether big or small, people always try to find ways to give something as a gesture of pride and appreciation. In fact, the act of giving gifts dates further back as the primitive times of our cavemen ancestors. 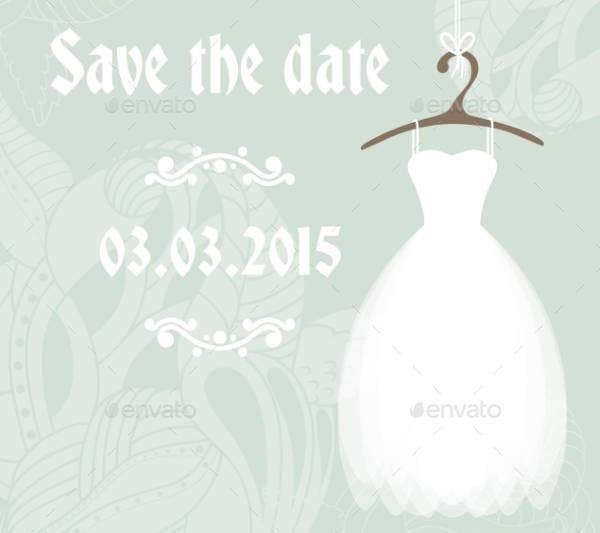 You may also see wedding card templates. Giving gifts has been engrained in our DNAs to show various kinds of emotion, some do it to show appreciation, and others because of pride. However way they were compelled to do so, the act of doing so is practiced long before humans became civilized and became more elaborate and modern with it. You may also see card Templates. As said, the act of giving gifts has been ingrained in every humans DNAs, thus making it appropriate for any events. 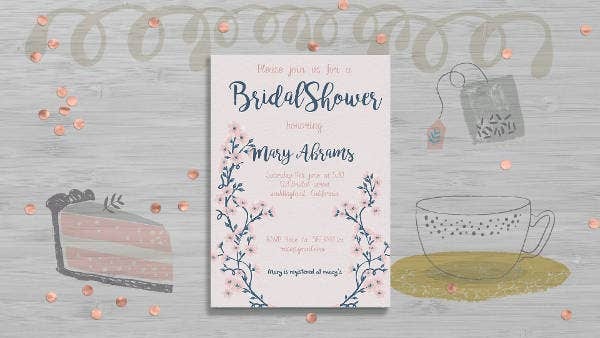 One of which where people truly see the need to give gifts on weddings and one activity that allows people to do so, especially for the bride-to-be, is through a shower or also known as the bridal showers. A bridal shower is an activity that allows the female guests to “shower” the bride before she steps into a new life of her own. It is simply known as the gift-giving part for the bride-to-be in anticipation of her wedding. Like how any event came to be, there is a story behind to how bridal showers started. It was in the events of the 16th century in Holland or Netherlands, where one of the two prominent recorded histories about bridal showers may have been derived. It was at a time when dowries were prevalent among families, where parents of the bride give gifts to the groom as a sign of approval and acceptance. 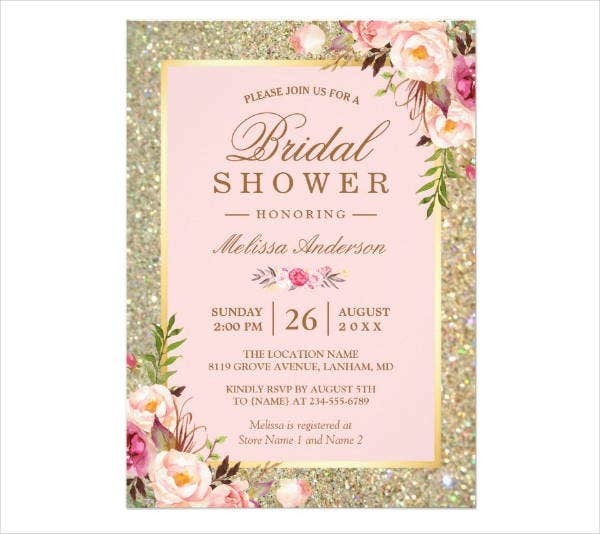 You may also see bridal shower invitation templates. However, in moments when the parents, the father most especially, do not support of their daughter’s choice of groom, the friends of the girl gather gifts to substitute the dowry the father deprived. They collect gifts to give to the girl, who will then give as a form of dowry to his future groom. And the second story the tradition of bridal showers may have been derived from is one that took place during the Victorian-era. Where friends of the bride-to-be gather together to wish her well and give her gifts as a gesture of appreciation. These gifts are placed inside a parasol which is then placed over her to make it appear as if she was being “showered” with gifts. You may also see bridal party invitations. More so, if one may have noticed, bridal showers back in the day consisted of only the bride-to-be and her girlfriends. Men were commonly discouraged and restricted from attending bridal showers for they might disrupt the dynamics of the events, especially with the topics most women commonly talk about. 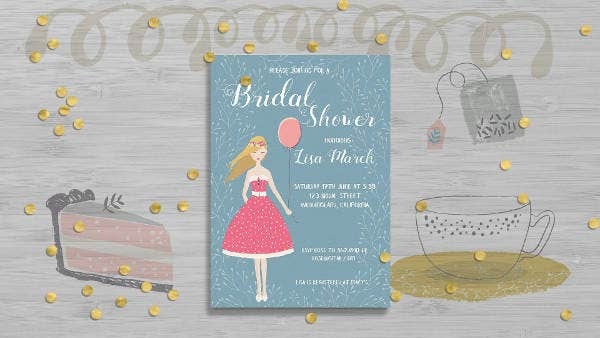 You may also see PSD bridal shower templates. 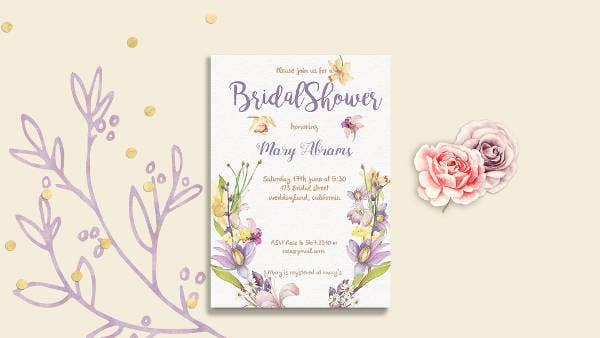 However, in this more modern and changing time, bridal showers have been openly celebrated by both the bride and groom-to-be, which ultimately paved the way for a bridal shower for both genders (e.g. Jack and Jill shower). With this occurrence of steering away from tradition, it has allowed those who organize bridal showers to invite every loved one dear to both the bride and the groom-to-be, which will help make the anticipation of the wedding even more meaningful. You may also see printable bridal shower samples. Bridal showers are the perfect opportunity to present the bride-to-be (and the groom-to-be) with gifts they can use, benefit from, in their new life together. Commonly, guests go for things the couple can put in their home or gift certificates or vouchers they can maybe use on their honeymoon. 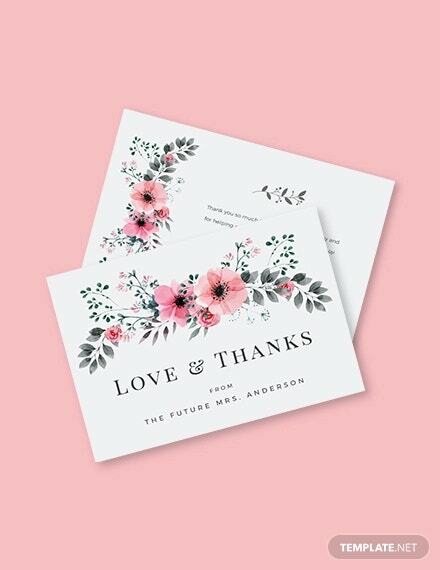 However, although it is somewhat a pressure to give a couple gifts they can both benefit from, on the bridal shower you can go for something as simple and modest as a card. A card can provide all sorts of emotions, whether heartfelt, bliss, or fun. A card simply has that capacity. So, if you are at a loss of ideas with which gifts to give the bride-to-be on her bridal shower, here are reasons why a simple card can make up for that. When you are faced with the dilemma of what gift to give, you can simply go for a card, especially during the bridal shower. It can be heartfelt, sincere, and a funny gesture making it all the more an ideal gift to give. You may also see wedding shower invitations. Nothing can compare to the feeling of receiving a card with a handwritten letter in an ocean of material things. Especially when there is a sample letter about how you feel towards the bride-to-be. This is an ideal option for those who cannot fully express themselves to people, as an aid, one can just put to words how they truly feel, which will then translate as a sincere and genuine gesture to the person the card is intended for. The gesture alone of going for something that so much thought has been poured into, albeit its simplicity, is one that can really touch the heart of people and in this case, the bride-to-be. Although almost all gifts given at a bridal shower can be kept, in terms of value over time, a card is incomparable. Just the fact that it increases its value to the person over the years makes it a more meaningful and special gift. Also, whenever one opts to keep cards for keepsakes they can, and that is truly one of the assets of a card. Not to mention, when nostalgia kicks in you get to recall the beautiful memories the card entails. 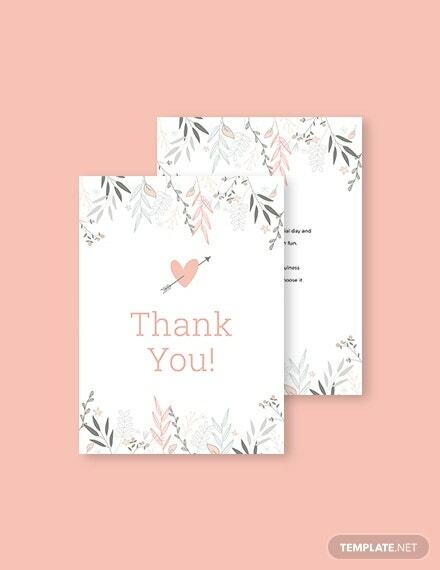 You may also see bridal shower thank you cards. 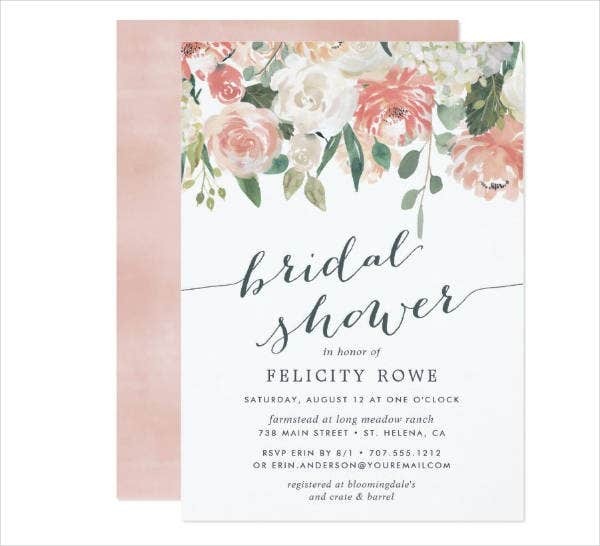 How to Acquire Your Very Own Bridal Shower Card? There are tons of ways one can acquire her very own bridal shower card. Ways that differ but ultimately provide similar results. However, among the options known to people, one remains a dominant choice because of its practicality and efficiency. The choice is still yours to make with how you wish to have yours done, but this is to convince that there is an option you can easily go to that does not compromise quality amidst its affordability, and that is the pre-made option. The pre-made option is simply buying designs and templates that are readily available online. 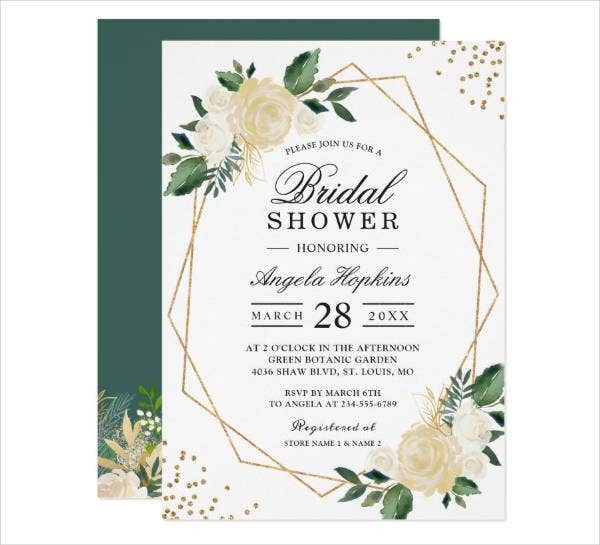 You may also see beautiful bridal invitations. Pre-made designs and templates, in general, are very affordable and this is because of how it was made by graphics artists on their terms. Unlike other options (i.e. having it custom made) which can be priced considerably because of the different aspects that will be taken into account. However, with a premade template, most designs are affordable since the graphics artists who create them are not obligated to follow any requirements or demands, just their own preference whenever they want. You may also see printable wedding cards. Since these designs and templates are premade, which means they are partially done, it makes working with it so much easier. You do not need to have extensive knowledge about the different software that will be used in creating your card or do you need to learn about it. Basic knowledge can already provide you with a card. Also, taking into consideration that these are premade with designs already laid out by the graphics artist for you, you have the option to finish what was started and style it up to your preference or you can just simply use it as an inspiration to base off of. You may also see bridal shower thank you notes. These designs and templates are fully editable and customizable to your preference, from texts, cool fonts, colors, sizes, and a few other elements that are in the design. You are simply given as much liberty and freedom to do whatever you want with the design you will go for. Also, at times, it comes with smart object layers or vector files that allow you to move around elements in the design to create a more personalized and more unique looking card. The pre-made option also comes with an array of design choices to choose from. Different designs for different preferences and tastes of people. There are simple card designs and templates for those who wish to convey a tone of seriousness; modern card designs and templates for those who want a more different and non-conforming card to gift. There are also card designs and templates that contain funny phrases to give the bride-to-be a good laugh. There is definitely one for every different people with different preferences. Giving a bride-to-be a gift does not have to be luxurious or grand, even a card with a heartfelt letter is more than enough. As they say “it is the thought that counts”, and it is what truly matters. When you put so much thought into what you plan to give, even if it is just a card, it is able to affect them in ways some other material things cannot. You just have to be sincere and genuine about it, as it is able to translate to the person it is intended for. 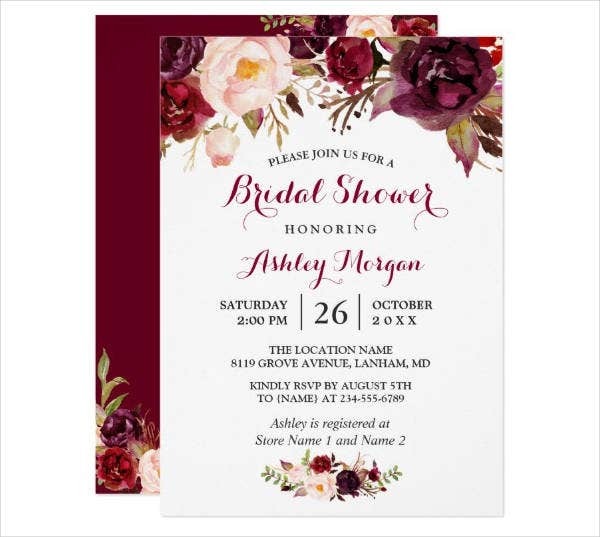 You may also see free bridal shower invitations. If you find this article helpful in any way, do not forget to bookmark this page for future references. And, kindly share this with other individuals seeking for cards to use as gifts for a simple bridal shower.